Göbekli Tepe (pronounced [ɟøbekˈli teˈpe]) "Potbelly Hill" in Turkish, is an archaeological site atop a mountain ridge in the Southeastern Anatolia Region of modern-day Turkey, approximately 12 km (7 mi) northeast of the city of Şanlıurfa. The tell has a height of 15 m (49 ft) and is about 300 m (984 ft) in diameter. It is approximately 760 m (2,493 ft) above sea level. The tell includes two phases of ritual use dating back to the 10th–8th millennium BCE. During the first phase, pre-pottery Neolithic A (PPNA), circles of massive T-shaped stone pillars were erected, the world's oldest known megaliths. More than 200 pillars in about 20 circles are currently known through geophysical surveys. Each pillar has a height of up to 6 m (20 ft) and a weight of up to 20 tons. They are fitted into sockets that were hewn out of the bedrock. In the second phase, Pre-Pottery Neolithic B (PPNB), the erected pillars are smaller and stood in rectangular rooms, also with floors of polished lime. The site was abandoned after the PPNB-period. Younger structures date to classical times. The details of the structure's function remain a mystery. It was excavated by a German archaeological team under the direction of Klaus Schmidt from 1996 until his death in 2014; Schmidt believed that they had been early neolithic sanctuaries. The site was first noted in a survey conducted by Istanbul University and the University of Chicago in 1963. American archaeologist Peter Benedict identified it as being possibly neolithic and postulated that the Neolithic layers were topped by Byzantine and Islamic cemeteries. The survey noted numerous flints. Huge limestone slabs, upper parts of the T-shaped pillars, were thought to be grave markers. The hill had long been under agricultural cultivation, and generations of local inhabitants had frequently moved rocks and placed them in clearance piles, possibly destroying archaeological evidence in the process. In 1994, Klaus Schmidt, of the German Archaeological Institute, who had previously been working at Nevalı Çori, was looking for another site to lead a dig. He reviewed the archaeological literature on the surrounding area, found the Chicago researchers’ brief description of Göbekli Tepe, and decided to give it another look. With his knowledge of comparable objects at Nevalı Çori, he recognized the possibility that the rocks and slabs were parts of T-shaped pillars. The following year, he began excavating there in collaboration with the Şanlıurfa Museum. Huge T-shaped pillars were soon discovered. Some had apparently been subjected to attempts at smashing, probably by farmers who mistook them for ordinary large rocks. The nearby Gürcütepe site—also Neolithic—was not excavated until 2000. Göbekli Tepe is on a flat and barren plateau, with buildings fanning in all directions. In the north, the plateau is connected to a neighbouring mountain range by a narrow promontory. In all other directions, the ridge descends steeply into slopes and steep cliffs. On top of the ridge, there is considerable evidence of human impact in addition to the actual tell. Excavations have taken place at the southern slope of the tell, south and west of a mulberry that marks an Islamic pilgrimage, but archaeological finds come from the entire plateau. The team has also found many remains of tools. Two taller pillars stand facing one another at the centre of each circle. Whether the circles were provided with a roof is uncertain. Stone benches designed for sitting are found in the interior. Many of the pillars are decorated with abstract, enigmatic pictograms and carved animal reliefs. The pictograms may represent commonly understood sacred symbols, as known from Neolithic cave paintings elsewhere. The reliefs depict mammals such as lions, bulls, boars, foxes, gazelles and donkeys; snakes and other reptiles, arthropods such as insects and arachnids; and birds, particularly vultures. At the time the edifice was constructed, the surrounding country was likely to have been forested and capable of sustaining this variety of wildlife, before millennia of settlement and cultivation led to the near–Dust Bowl conditions prevalent today. Vultures also feature prominently in the iconography of Çatalhöyük and Jericho. Professor of Archaeology Steven Mithen, suggests that in the early Neolithic culture of Anatolia and the Near East the deceased were deliberately exposed in order to be excarnated by vultures and other carrion birds. (The head of the deceased was sometimes removed and preserved — possibly a sign of ancestor worship.) This, then, would represent an early form of sky burial, as still practiced by Tibetan Buddhists and by Zoroastrians in Iran and India. Few humanoid figures have appeared in the art at Göbekli Tepe. However, some of the T-shaped pillars have human arms carved on their lower half, suggesting that they are intended to represent the bodies of stylized humans (or perhaps gods). Loincloths also appear on the lower half of a few pillars. The horizontal stone member on top is thought to symbolize a human head. The pillars as a whole therefore have an anthropomorphic identity. Whether they were intended to serve as surrogate worshippers, symbolize venerated ancestors, or represent supernatural, anthropomorphic beings is not clear. At Pillar 27, Enclosure 2, Layer III, the discovery of a predator—perhaps a leopard—has excited particular interest for being carved almost in the round, hinting at a degree of artistic training and division of labor that is again surprising in a hunter-gatherer society. Some of the floors in this, the oldest, layer are made of terrazzo (burnt lime), others are bedrock from which pedestals to hold the large pair of central pillars were carved in high relief. Radiocarbon dating places the construction of these early circles in the range of 9600 to 8800 BC. Carbon dating suggests that (for reasons unknown) the enclosures were backfilled during the Stone Age. The surviving structures, then, not only predate pottery, metallurgy, and the invention of writing or the wheel, they were built before the so-called Neolithic Revolution, i.e., the beginning of agriculture and animal husbandry around 9000 BCE. But the construction of Göbekli Tepe implies organization of an advanced order not hitherto associated with Paleolithic, PPNA, or PPNB societies. Archaeologists estimate that up to 500 persons were required to extract the heavy pillars from local quarries and move them 100–500 meters (330–1,640 ft) to the site. The pillars weigh 10–20 metric tons (10–20 long tons; 11–22 short tons), with one still in the quarry weighing 50 tons. It has been suggested that an elite class of religious leaders supervised the work and later controlled whatever ceremonies took place. If so, this would be the oldest known evidence for a priestly caste—much earlier than such social distinctions developed elsewhere in the Near East. Schmidt's view was that Göbekli Tepe is a stone-age mountain sanctuary. Radiocarbon dating as well as comparative, stylistical analysis indicate that it is the oldest religious site yet discovered anywhere. Schmidt believed that what he called this "cathedral on a hill" was a pilgrimage destination attracting worshippers up to 100 miles (160 km) distant. Butchered bones found in large numbers from local game such as deer, gazelle, pigs, and geese have been identified as refuse from food hunted and cooked or otherwise prepared for the congregants. Schmidt considered Göbekli Tepe a central location for a cult of the dead and that the carved animals are there to protect the dead. Though no tombs or graves have been found so far, Schmidt believed that they remain to be discovered in niches located behind the sacred circles' walls. Schmidt also interpreted it in connection with the initial stages of the Neolithic. It is one of several sites in the vicinity of Karaca Dağ, an area which geneticists suspect may have been the original source of at least some of our cultivated grains (see Einkorn). Recent DNA analysis of modern domesticated wheat compared with wild wheat has shown that its DNA is closest in sequence to wild wheat found on Karaca Dağ 20 miles (32 km) away from the site, suggesting that this is where modern wheat was first domesticated. Such scholars suggest that the Neolithic revolution, i.e., the beginnings of grain cultivation, took place here. Schmidt believed, as others do, that mobile groups in the area were compelled to cooperate with each other to protect early concentrations of wild cereals from wild animals (herds of gazelles and wild donkeys). Wild cereals may have been used for sustenance more intensively than before and were perhaps deliberately cultivated. This would have led to early social organization of various groups in the area of Göbekli Tepe. Thus, according to Schmidt, the Neolithic did not begin on a small scale in the form of individual instances of garden cultivation, but developed rapidly in the form of "a large-scale social organization". 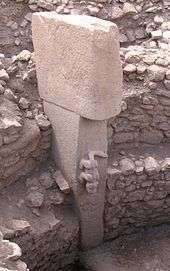 Schmidt engaged in some speculation regarding the belief systems of the groups that created Göbekli Tepe, based on comparisons with other shrines and settlements. He assumed shamanic practices and suggested that the T-shaped pillars represent human forms, perhaps ancestors, whereas he saw a fully articulated belief in gods only developing later in Mesopotamia, associated with extensive temples and palaces. This corresponds well with an ancient Sumerian belief that agriculture, animal husbandry, and weaving were brought to mankind from the sacred mountain Ekur, which was inhabited by Annuna deities, very ancient gods without individual names. Schmidt identified this story as a primeval oriental myth that preserves a partial memory of the emerging Neolithic. It is also apparent that the animal and other images give no indication of organized violence, i.e. there are no depictions of hunting raids or wounded animals, and the pillar carvings generally ignore game on which the society depended, such as deer, in favor of formidable creatures such as lions, snakes, spiders, and scorpions. Expanding on Schmidt's interpretation that round enclosures could represent sanctuaries, Gheorghiu's semiotic interpretation reads Göbekli Tepe's iconography as a cosmogonic map which would have related the local community to the surrounding landscape and the cosmos." Göbekli Tepe is regarded as an archaeological discovery of the greatest importance since it could profoundly change the understanding of a crucial stage in the development of human society. 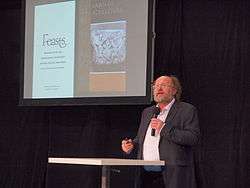 Ian Hodder of Stanford University said, "Göbekli Tepe changes everything". If indeed the site was built by hunter-gatherers as some researchers believe then it would mean that the ability to erect monumental complexes was within the capacities of these sorts of groups which would overturn previous assumptions. Some researchers believe that the construction of Göbekli Tepe may have contributed to the later development of urban civilization, as excavator Klaus Schmidt put it, "First came the temple, then the city." Tell Aswad – a c.9000 BCE site in Syria. 1 2 "GHF - Gobekli Tepe, Turkey - Overview", globalheritagefund.org: GHF3. 1 2 "History in the Remaking". Newsweek. 18 Feb 2010. ↑ Sagona, Claudia. The Archaeology of Malta. Cambridge University Press. p. 47. ISBN 9781107006690. Retrieved 25 November 2016. ↑ Curry, Andrew (November 2008). 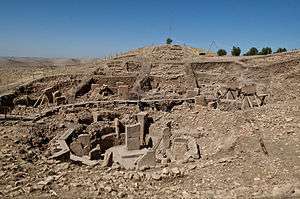 "Gobekli Tepe: The World's First Temple?". Smithsonian.com. Retrieved August 2, 2013. ↑ Peter Benedict (1980): Survey Work in Southeastern Anatolia. In: Halet Çambel; Robert J. Braidwood (ed. ): Prehistoric Research in Southeastern Anatolia I. Edebiyat Fakültesi Basimevi, Istanbul, pp. 151–191. 1 2 3 4 5 6 7 Curry, Andrew (November 2008). "Göbekli Tepe: The World's First Temple?". Smithsonian Institution. Retrieved 2009-03-14. ↑ Klaus Schmidt: Sie bauten die ersten Tempel. Das rätselhafte Heiligtum der Steinzeitjäger. Die archäologische Entdeckung am Göbekli Tepe. Munich 2006, p. 102. ↑ Klaus Schmidt: Göbekli Tepe. Eine Beschreibung der wichtigsten Befunde erstellt nach den Arbeiten der Grabungsteams der Jahre 1995-2007. In: Erste Tempel - Frühe Siedlungen. 12000 Jahre Kunst und Kultur. Ausgrabungen und Forschungen zwischen Donau und Euphrat. Oldenburg 2009, p. 188. ↑ Mithen 2004, pp. 93–96. ↑ Schmidt, 2010, p. 251. ↑ Schmidt 2010, pp. 239, 241. ↑ "Which came first, monumental building projects or farming?". Archaeo News. 14 December 2008. ↑ Taracha, Piotr (2009). Religions of second millennium Anatolia. Eisenbrauns. p. 12. ISBN 978-3-447-05885-8. ↑ Schmidt 2010, pp. 242—243, 249. ↑ Schmidt 2006, pp. 193–4; 218. ↑ "GHF - Göbekli Tepe - Turkey", globalheritagefund.org, web: GHF2.